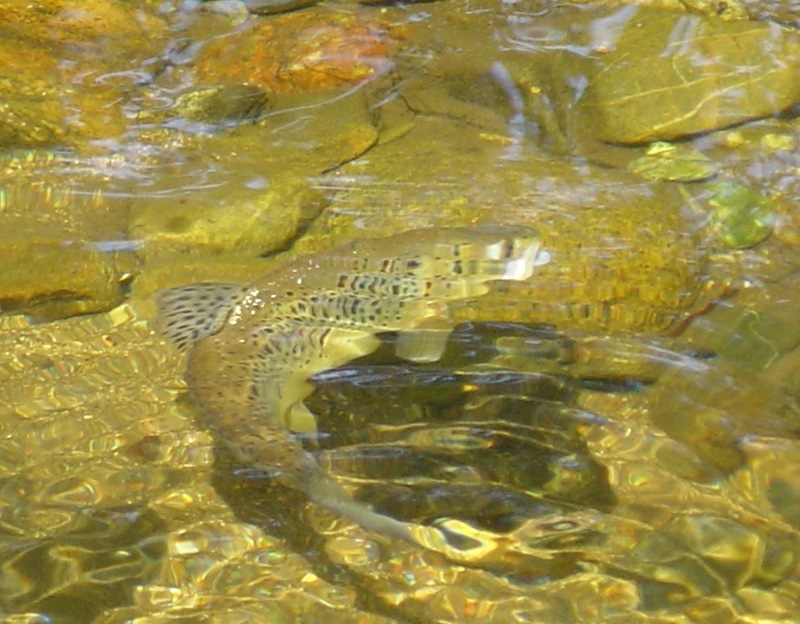 On the Dart the Brown Trout season extends from 15th March until 30th September. The water marked in green on the map is available for day ticket fishing. Perhaps due to the nature of the river, with less natural food than, for instance, the classic chalk stream, a good proportion of our trout tend to smolt and go to sea to feed and return to the Dart as sea trout. However, while mostly of modest size there are resident trout, occasionally of up to about three pounds in weight. A four or five-weight outfit with a rod of about 8ft would be suitable for general trout fishing, with floating and, if using wet fly, intermediate lines. During the early part of the season the classic fly to use on the Dart is the Pheasant Tail Nymph, especially useful during colder spells. A GRHE nymph is also a good bet, perhaps in gold-head form. Wet flies such as March Brown or Blue Upright could also be productive. As the weather warms up the trout will start to rise to a fly. As implied above, there are no great hatches of up-winged flies so the fish tend to be rather opportunist feeders, with dry flies such as BWO’s, other olives and Klinkhamers often being successful. There are usually plenty of sedges about so any sedge imitation is always worth a try, with Elk Hair Caddis being a good general pattern. The latter can be used to good effect especially later in the season, fished in the faster water. In high summer the trout can become a bit fickle and a tiny Black Gnat of about size twenty may be required to tempt them. There is a bag limit of two brown trout per day although, as always, catch and release is encouraged. The following footage, originally on VHS, is taken from a video made by DAA members a few years ago. In it, David Grove gives tips on how to catch our brownies. Please note that the river is no longer stocked as mentioned. Much more information on trout is available from The Wild Trout Trust, a worthy organisation that we would encourage all to join. Click on their logo to visit their website.